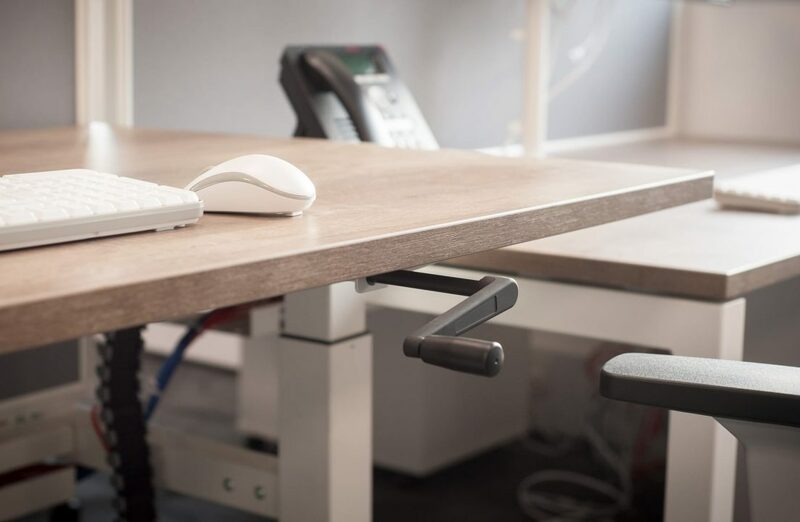 This project was part of a major office relocation for one of the UK’s leading corporate and safety clothing suppliers; Safpro in Gloucester. Until the end of 2016 their sales, administration and management staff were divided into several small offices along a long, narrow corridor off the warehouse. Over a period of 2 years they constructed a large ‘state of the art’ commercial building on their current premises to move to. The ground floor contains a large storage and distribution area, a trade counter and safety wear shop, washrooms and a meeting room. 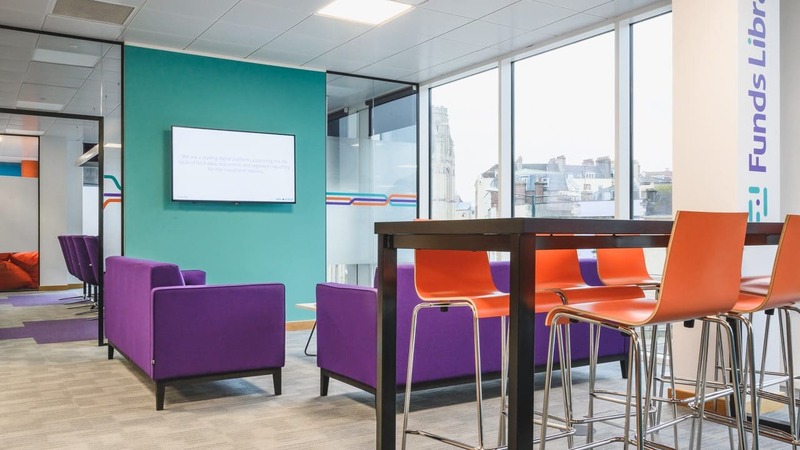 On the second floor they have a modern, light office, incorporating breakout areas, a kitchen tea point and additional washrooms. 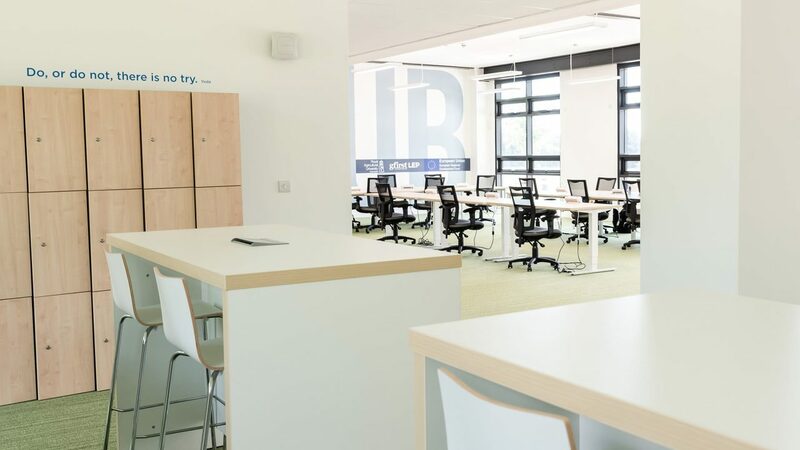 The landmark building offers a large open plan space for workstations and training areas over 2 floors, set off a full height entrance hall with galleried staircase and plenty of car parking outside. 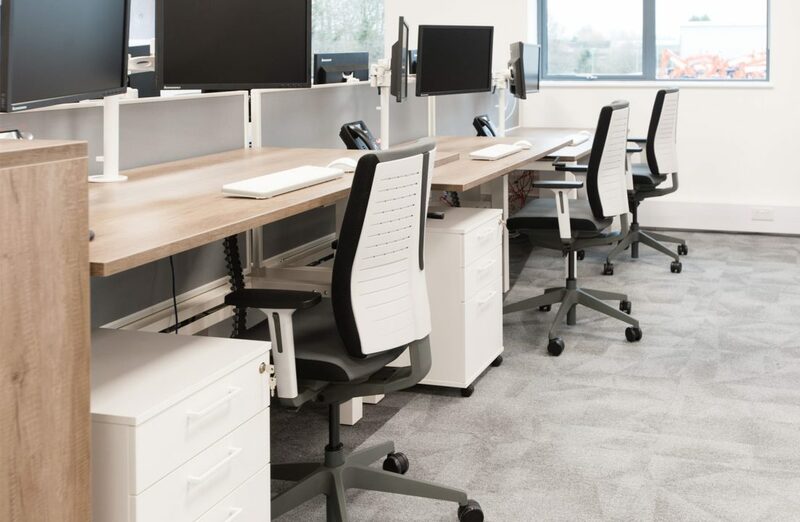 The contract requirements from Safpro included the supply of all new desking, task chairs, storage, breakout furniture plus carpet and LVT flooring. 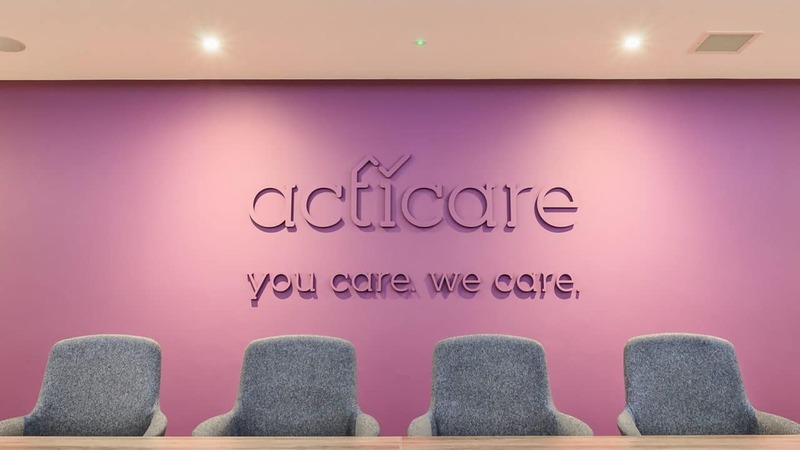 The directors felt they needed to increase efficiency and cost-effectiveness, while modernising their office space. 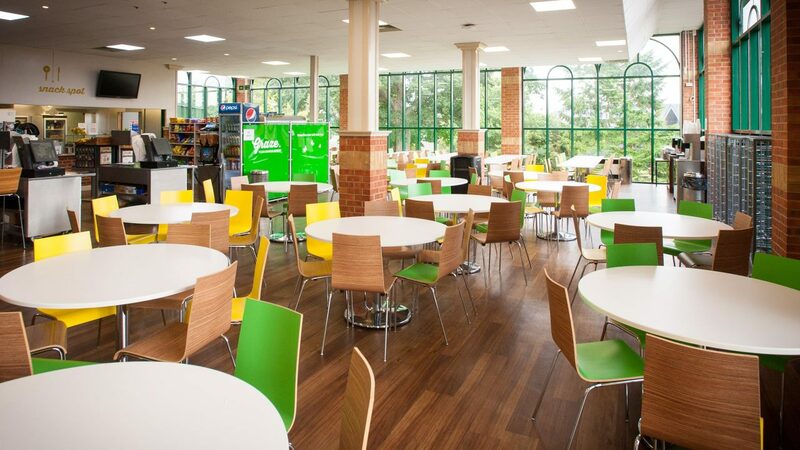 We felt very fortunate to be chosen to specify & supply the loose furniture to the entire new building. This project required us to use our extensive experience to specify the correct product for the right purpose. 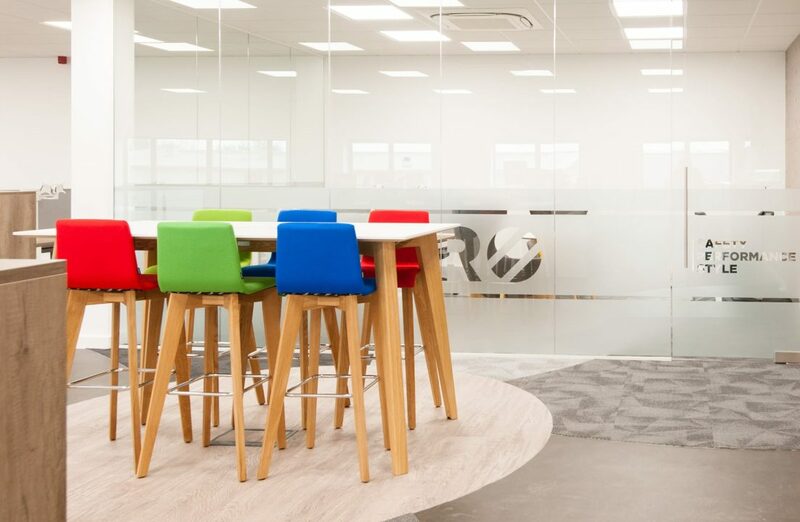 To facilitate both sales and management staff we used the ‘Chemistry’ height adjustable desking range partnered with ‘Freeflex’ task seating, both from Senator, to create a busy and inspiring open plan office. 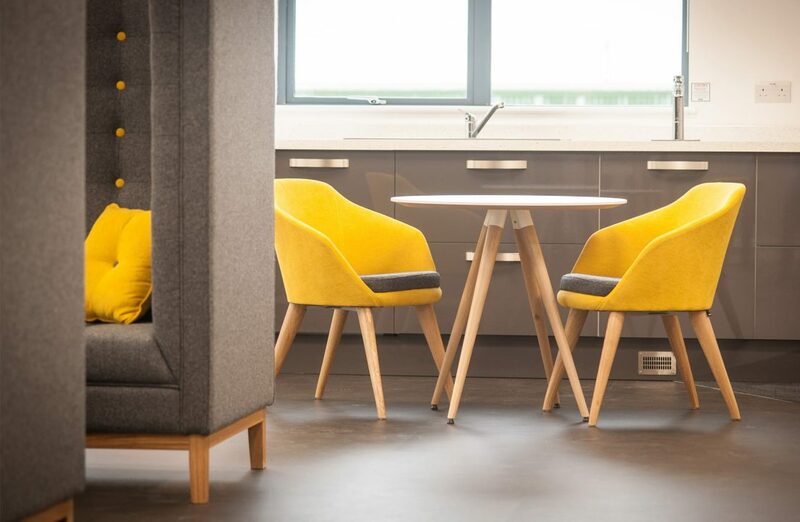 There was a lot of input required from our head designer – she created spaces for informal and formal meetings using various Frovi social furniture products. 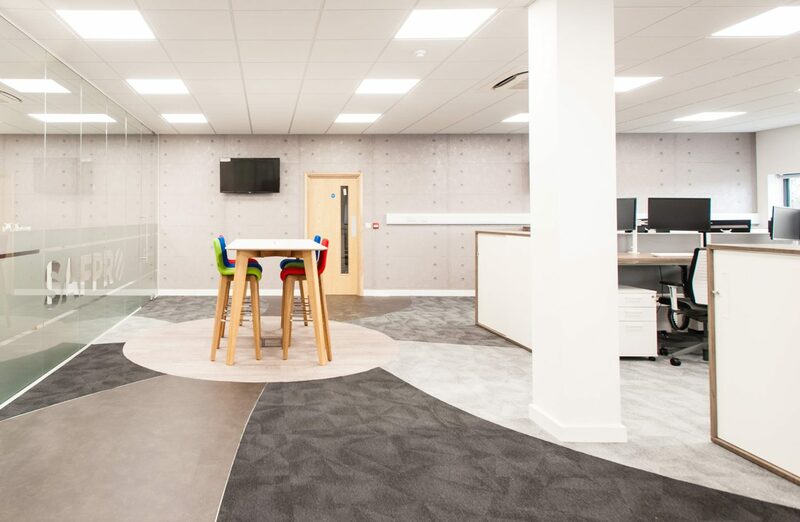 She also used a selection of Forbo carpet tile and LVT flooring products to form a unique ‘Catherine wheel effect’ on the main office floor. We provided high class soft seating from the Jig and Elk ranges, again from Frovi, for the collaborative and staff relaxation zones. We then applied the finishing touches by installing matching Forbo flooring to the main entrance, staircase and washrooms.